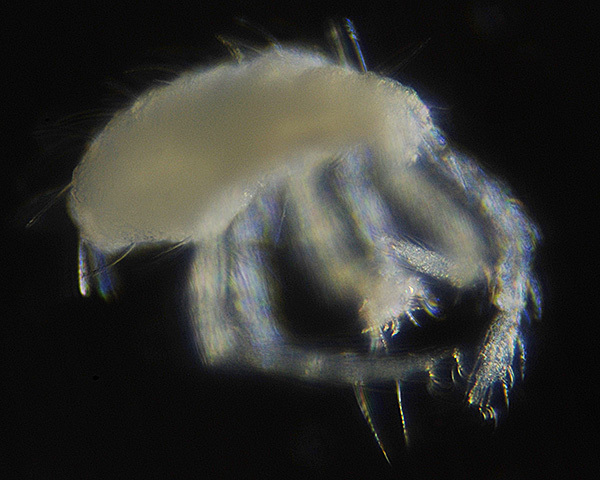 The first image below shows an apterous adult Amphorophora rubi in alcohol. The second image below shows a close-up of the swollen siphunculi. 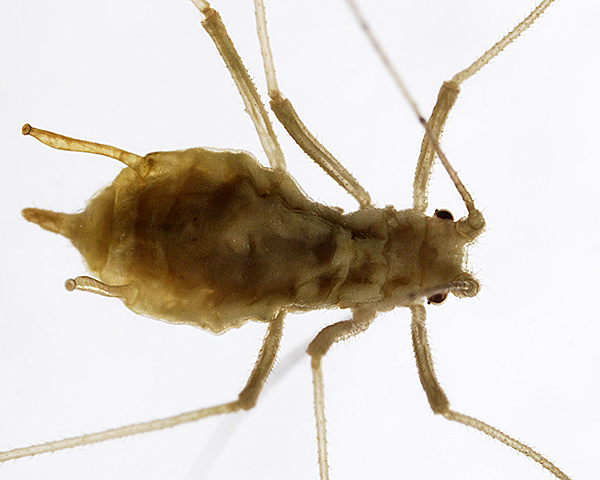 The clarified slide mounts below are of adult viviparous females of a closely related sprecies, Amphorophora idaei : wingless, and winged, a species on raspberry that is (almost) morphologically indistinguishable from Amphorophora rubi. Blackman et al. (1977) separated Amphorophora rubi from Amphorophora idaei by cytological studies, which showed that the chromosome complement of Amphorophora occurring on red raspberry in Europe differed from that of Amphorophora sampled from blackberry (2n = 18 and 20 respectively). 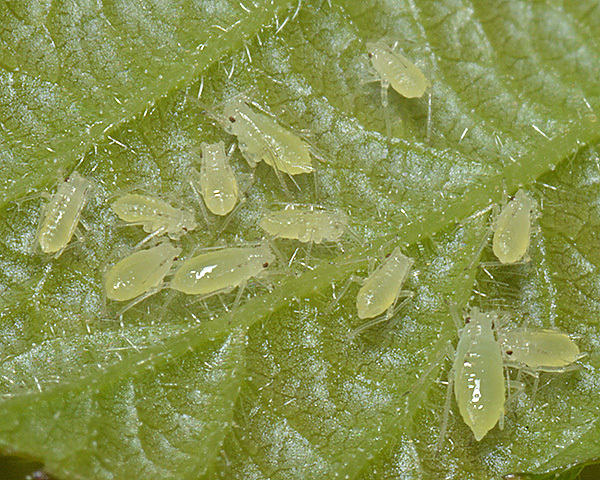 They concluded Amphorophora idaei only occurs on raspberry. 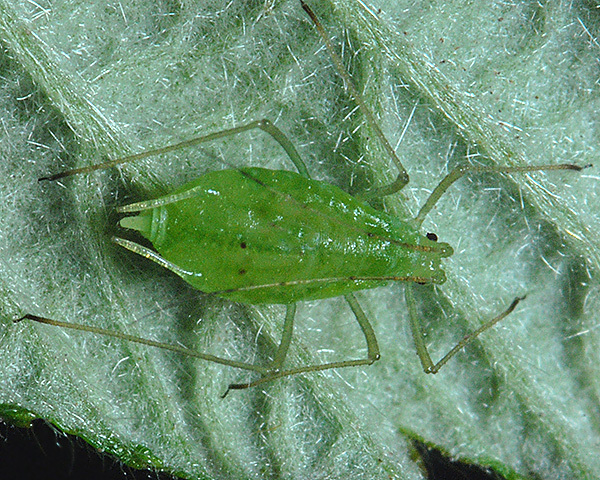 Little has been written about the biology and ecology of the large blackberry aphid (Amphorophora rubi), although it is likely in many respects to be similar to the European large raspberry aphid (Amphorophora idaei), the biology of which was reviewed by McMenemy et al. (1976). Our field records suggest that the overwintering eggs of Amphorophora rubi hatch in March to give apterae by May-June. 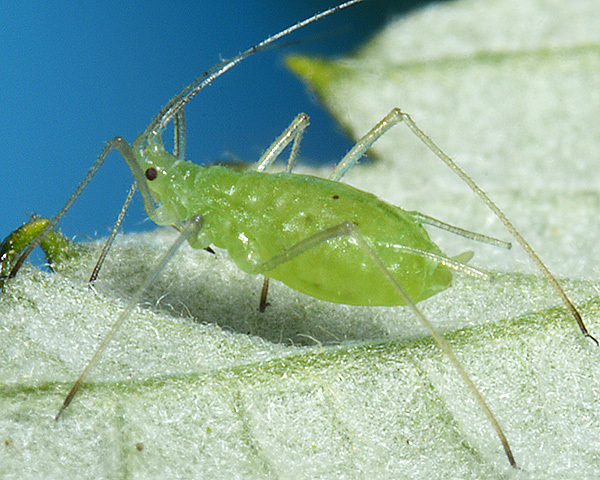 The aphids below were found on bramble in an unheated glasshouse in mid-April. We have found that alatae (see first picture below) start to appear somewhat earlier (mid May) than is reported for Amphorophora idaei, and then disperse to found colonies on new plants (see second picture below). 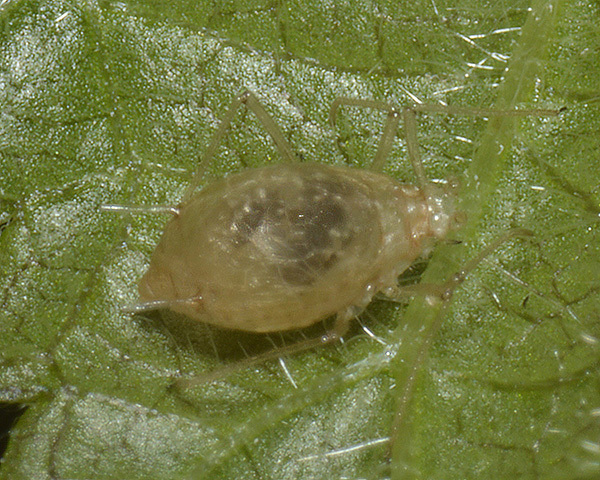 As with the raspberry aphid, the apterous nymphs and adults are very mobile, and drop from the plant when they are disturbed. This appears to be their main strategy for dealing with predators. 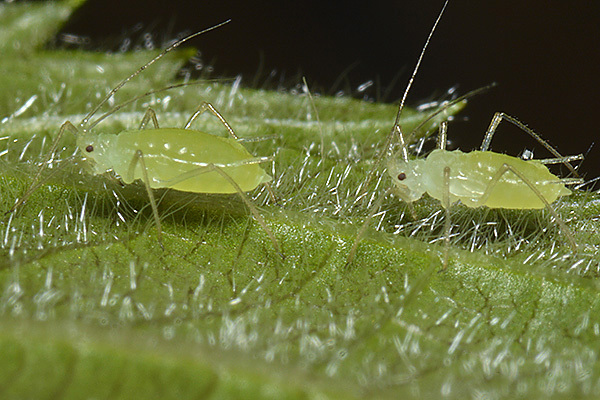 Note by the way that the swollen siphunculi are not always very apparent in photos of the aphid, as is evident in the second picture below. 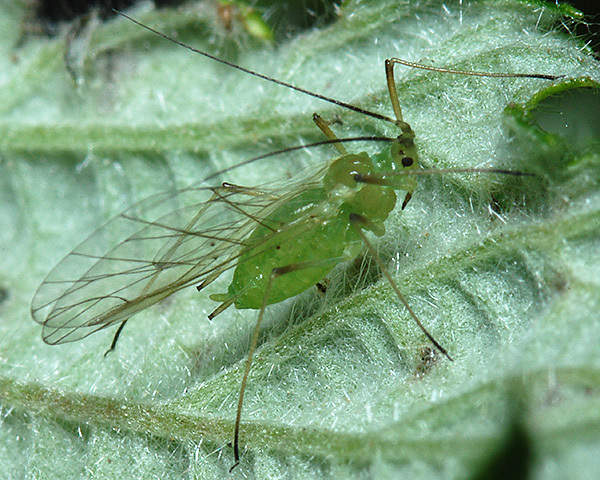 Oviparae and males begin to appear in October, although part of the population continues to reproduce parthenogenetically throughout winter. 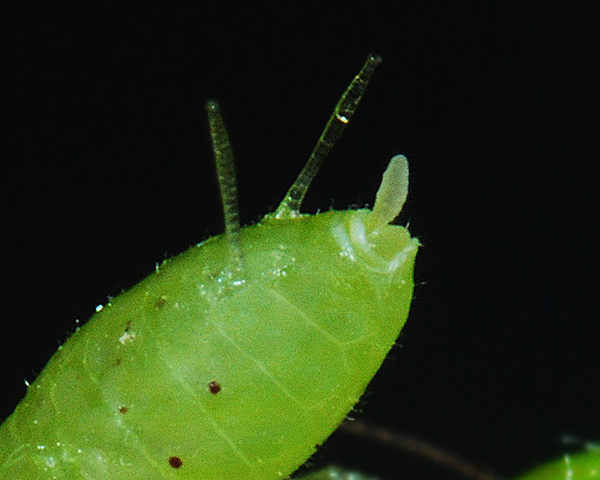 We have found parasitized Amphorophora rubi on several occasions. 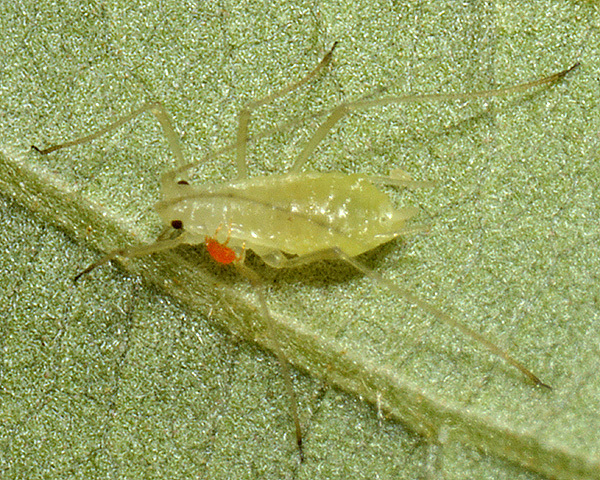 The picture below shows a recently mummified aphid - note especially the strands of silk holding the mummy to the leaf. 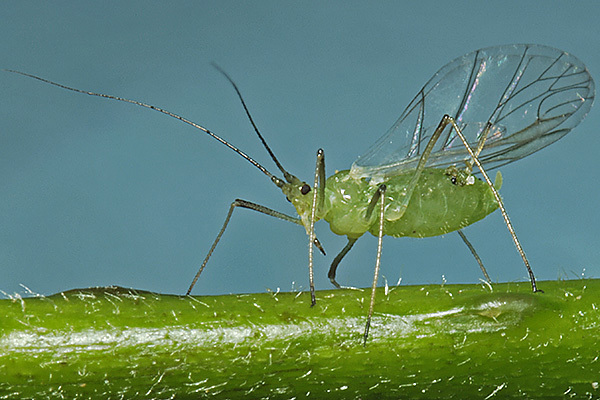 Various parasitoids have been recorded attacking Amphorophora rubi. Tomanovic et al. (2009) recorded Ephedrus lacterosus in Serbia & Montenegro. Muller et al. 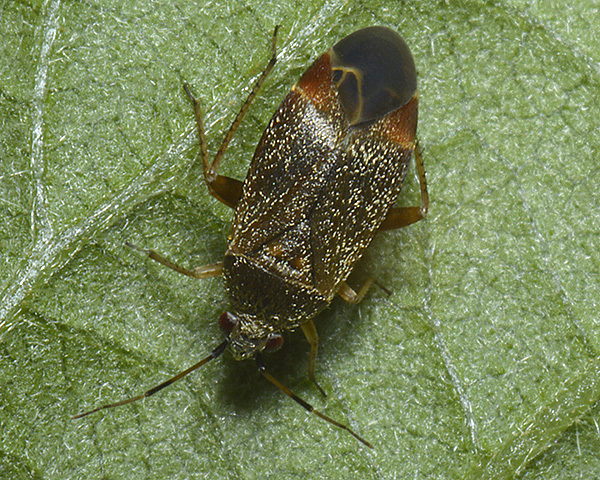 (1999) reported Praon dorsale, Aphidius rubi and Aphelinus abdominalis, and the hyperparasites Asaphes vulgaris, Copruna clavata and Phaenoglyphis xanthochroa. 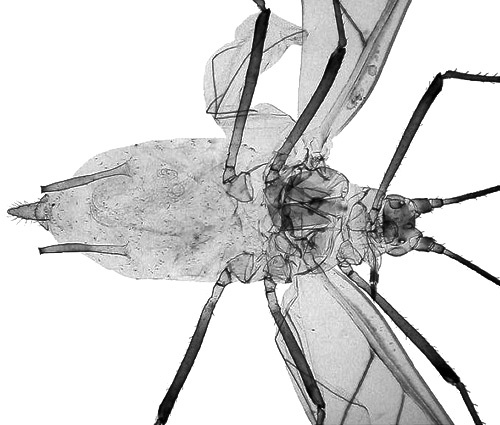 We have not found large numbers of predators around Amphorophora rubi colonies, although the predatory bug shown below was feeding on the Amphorophora. We have observed fungal pathogens rather more often. 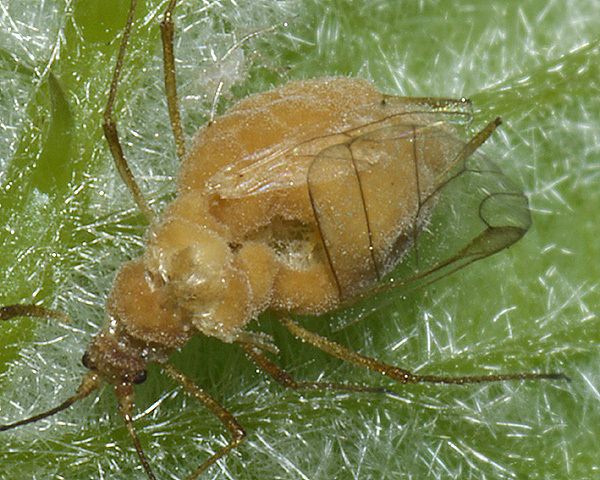 The image below shows an alate Amphorophora rubi killed by an Entomophthora pathogen. 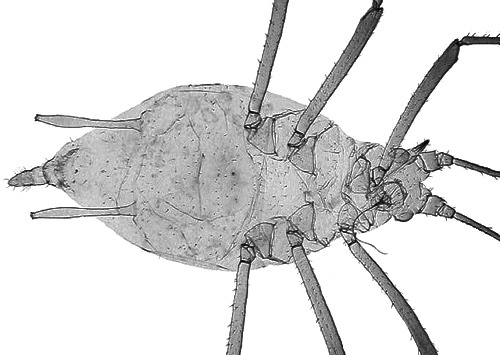 The effect of larval trombidid mites on an individual aphid depends on the parasitic mite load and the age/size of the aphid. 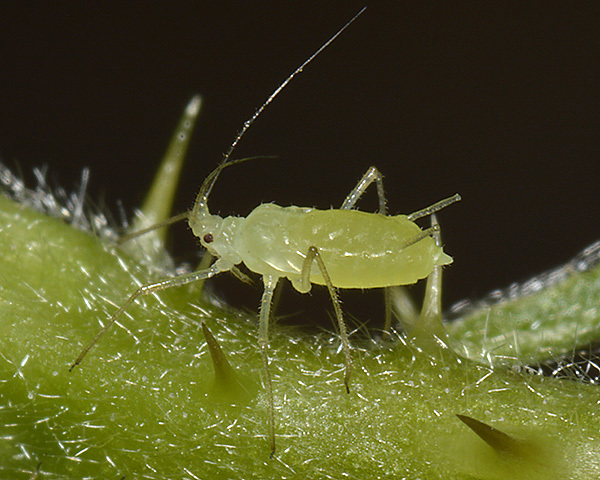 A single mite reduces the aphid's fecundity, but several on the same aphid may kill the host (for more information see mites on aphids). 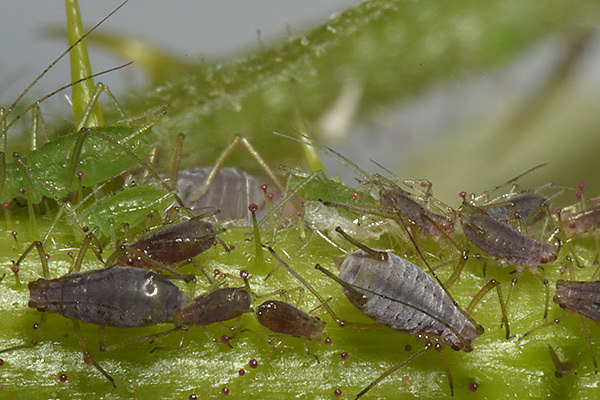 Sometimes the different species form mixed species colonies as is shown below, with Amphorophora rubi (green) and Macrosiphum funestum (reddish) forming a mixed species colony on Rubus.